When running and observing coaching sessions I am asked ‘what would make me a better coach?’. In the majority of the situations I give the feedback… listen more, use silence more and stop asking leading questions which lead to the coach giving advice. Let them take responsibility, replace ‘we’ with ‘you’ e.g. what can you do to….? At suitable stages in the session get the coachee to summarise the points coverred rather than you do it. 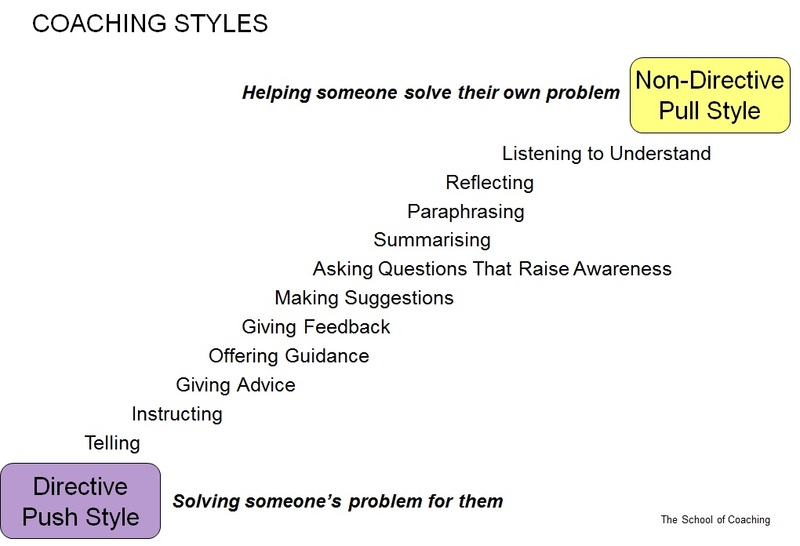 To identify what your style of coaching is, have a look at the coaching spectrum below and note down the techniques you currently use. Try using some of techniques you dont use when applicable. If you have any questions or want to share your thoughts on coaching, feel free to use the comment box below. Many of us unfortunately work in enviroments where the atmosphere is less than positive and new ideas are greeted with ‘that wont work in the real world’, however, if you look at the truly innovative ideas and products of the last 20 years they probably met with the same response. Now the book controversially advises against long term business plan and as a executive coach you may be surprised that I kind of agree when it comes to development. I have met people that have 5 year plans and that works out for them but it isn’t for everyone. To test the theory ask yourself, am I where I wanted to be after the last 5 years? Has the business stuck to its long term plan? Have a Vision of where you want to be eventually, however concentrate on what needs to be done now take action to meet to immediate needs, stay flexible so that you are open to unexpected opportunities. We all change as people as we get older we should acknowledge this and change our plan as appropriate. Leaders hate problems and love solutions… so if your call to arms to change something in the workplace falls on deaf ears it is because you aren’t presenting solutions. Start making the solution, this could be a short presentation, run a pilot using your ideas, putting an unofficial mentoring programme in place etc. Then when you have the facts and can show success then people will be more open to your ideas. I am always amazed when there is a success then people start talking about how they were involved, when they weren’t that interested in the first place. Learning& development budgets are currently been slashed in spite of recent research showing that companies that spend on development have better productivity, but rather than dwell on this it is time to be more creative. Sometimes wholesale change in your life can be overwhelming and it allows our inner critic to step in an scupper our motivation. Also if things go wrong on what you see as a massive goal it can become a source of embarassment, the critics in our reality have won. So, make small changes in your life and stick to them and once it has become the norm add another before long you will have made a massive change. Another tip is not to talk to much about the changes as it may lessen the energy of the idea, just keep doing it and you will start to hear people commenting on your positive change. If your are thinking about buying a new book, here is a link to someone who read 200 and his thoughts. You are probably thinking that I have lost my marbles with the title of this post, however stay with me. We put so much emphasis on clever pitches, presentations and influencing people (all important) in meetings or waxing lyrical to our partners and family about our day that we tend not to consider our listening skills. Are we truly listening or are we just waiting for our chance to put across our point of view that matches our agenda / objective, maybe even satisfying our ego? If you have mentally ticked yes to any of these then you may not be ‘living in the moment’ and truly listening and have the potential to miss important chances to communicate or influence someone in the most effective way. You may be treating symptoms not the root cause and so they are less likely to see the merits in your solution. Switch off any ‘interference’ that can affect your listening. ‘I have so much work and so many meetings that I need to multi-task’ is a common objection to this, however this is more about saying yes rather than no which I will cover in future post. Listening effectively will help time management as you will not have to cover the same ground again; you have closed the sale or articulated your point or feelings in a persuasive way. If you have an important meeting then you need to be in zone 5 as sometimes… what is not being said is as important as what is. So my challenge is to practice empathetic listening at least once a day and record how you get on. You might want to start with family members or friends, remove any distractions TV etc. sit down and ask them about their day and stay in zone 5!